The spirit of southern hospitality is alive and well in Belmond Charleston Place. Like any self-respecting southern belle, Belmond Charleston Place has charm and style to spare, plus a strong reverence for tradition. Reigning over Meeting Street amid the stately homes and cobblestone streets of the city's historic district, the hotel looks both backward and forward with panache. Stepping into the lobby with its marble floor, sweeping double staircase, and chandelier may inspire you with a sense of Gone With the Wind déjà vu, and that antebellum ambience continues in the guest rooms, done with swagged draperies, period reproduction escritoires and four-poster beds, roll-arm sofas, and the like. In such a setting, partaking of a refined afternoon tea in the Thoroughbred Club off the lobby or seeing a horse-drawn carriage pull up in the circular entrance drive seems the most natural thing in the world. 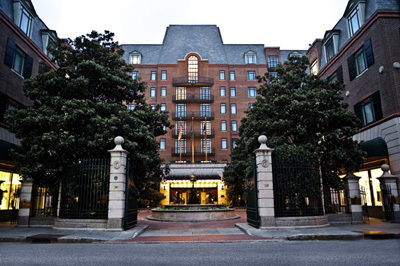 But Belmond Charleston Place is, of course, perfectly up-to-the-minute in all the ways that count. Prime evidence of this is to be found atop the hotel, where imported Mexican tile edges the horizon-edge pool and a retractable roof draws back to let swimmers and sunbathers bask under the blue sky in perfect privacy. The sleek adjoining spa imports all kinds of techniques and treatments from around the world—and so does the award-winning Charleston Grill downstairs, which tempts sophisticated palates with creations such as lobster tempura over lemon grits with fried mini green tomatoes. Charleston proper offers all the proper pursuits of a well-bred Southern city: historic sites, a gorgeous waterfront, shopping, and excellent restaurants. And if you really want to "rough it," venture out to the superb beaches and golf courses nearby. Your Italian marble bath will be waiting when you return to dress for dinner.